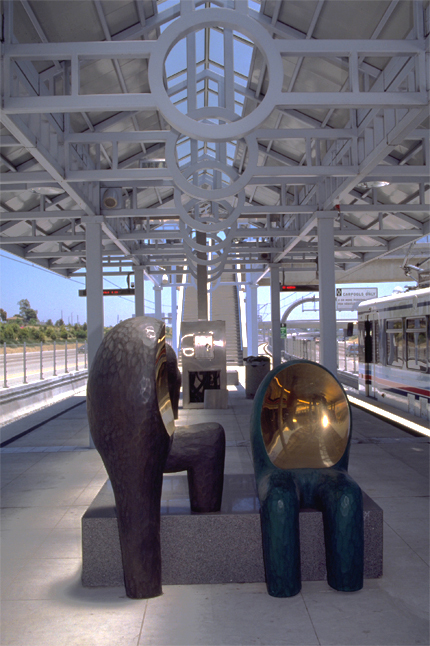 Companions is a series of cast bronze sculptures distributed throughout the station which introduce human scale to the often overwhelming environment. The figures, which represent various age groups, interact with passengers and each other. Up close, their smooth surface reflects a distorted image of the viewer. Grimmer also designed the polished granite benches at the station, providing harmonious seating for both passengers and the figural sculptures. "These figures are meant to be understood on different levels. They can appear to be companions to take along on a mental journey or to greet on the return. Upon catching a glimpse of his/her distorted reflection in the sculptures, the commuter may realize that however familiar we are to ourselves we may appear odd to others. Such a realization can be the first step to broadening our appreciation of the variety of ethnicities and lifestyles within our community and the world."